His answer, is that innovation is critical to human progress. It is also important from a government perspective, however, because innovation drives economic growth, which in turn fuels government income. Shapiro is well-versed in the topic of innovation. He has over 400 articles on the topic as well as the two best-selling books: "The Comeback: How Innovation Will Restore the American Dream" and "Ninja Innovation". “So what does it take to be innovative?” Shapiro asks next. Of course it takes ideas. Beyond that Shapiro argues that both governments and culture also play an important role. Governments can create a climate where taking a financial risk can be survived. Regarding culture, Shapiro argues that a person is to less likely to be innovative if the live in a culture which frowns on failing. “Pushing the envelope is respected in the United States,” says Shapiro. “And authority has never really been respected.” Compared to China, where progress is incremental, Shapiro feels America has a more breakthrough approach to business. Shapiro recently attended the International CES. He found the truly innovative story was not a specific product, but the clusturs of innovation in different product areas presented there. “Innovation is good and positive, and it can happen anywhere if the culture is supportive,” Shapiro ends his talk before being joined by HarperVision's Greg Harper on stage for the Q&A. Prompted by Harper, Shapiro describes his view of European innovation. "I have not been particularly positive about European innovation in the past to be honest. But I’ve changed my view in the last year.” Particularly car innovation is an exciting area, both he and Harper agree. In Europe patent lawsuits are also not as big a problem as in the US. "Lawsuits a really a big problem in the States," says Shapiro, who is a lawyer himself by training. Turning to the issue of privacy, which has been discusses a lot at DLD14, Harper asks whether "privacy matters anymore?" "Of course it does!" Shapiro says. Privacy occurs on three levels, he believes. On the first level there are governments. Snowden's revelations have exposed the US government gathering information without citizens' knowledge. "That's frankly an embarrassment to our country and I think measures will be taken." The second level is government control of company policy. Again in the US, this used to be an issue. But Shapiro says slowly "companies are pushing back". Lastly, there is the question of how businesses deal with customers. "In my view, to be successful everything must be clear and transparent. Having said that, people give up information on themselves for free all the time. That's part of the Internet – and it has both risks and benefits." 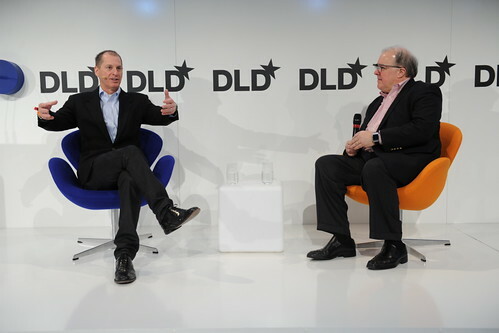 Ending the talk, Gary Shapiro gives a shout-out to Zuzanna Lewandowska, co-founder of The Kings Foundation, whom he just met at DLD14. Steffi Czerny immediately invites Lewandowska on stage to say a few words on her organization, which helps send the brightest minds in developing countries to the best schools around the world.